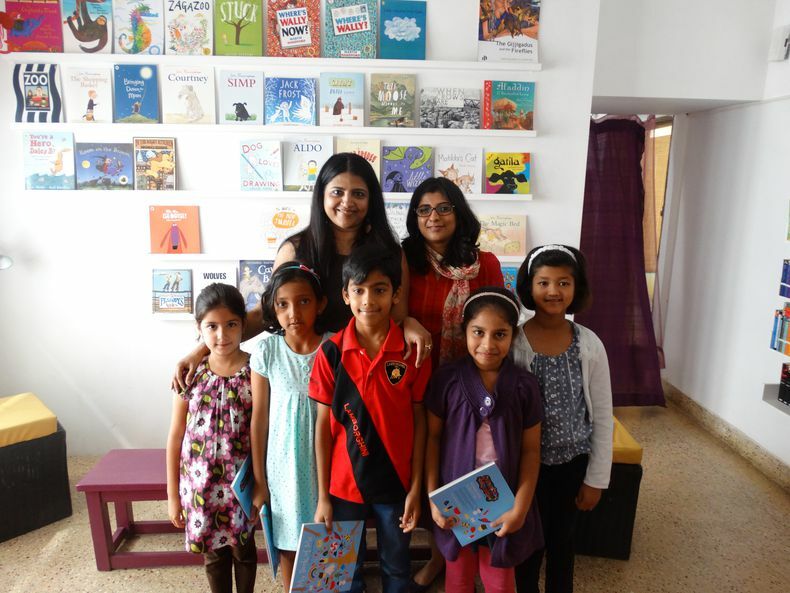 Aparna Raman decided to work with children after experiencing the fun and wonder of raising her son Rohan. She founded Timbuktoo Publishing to represent children's free, unhindered, individual aspect of imagining and self expression. Her son Rohan, at 7 had created his first Comic strip series, with a superhero named Captain Pooky who battled hamsters, evil scientists, robots, aliens and skeletons with gusto! Aparna also observed Rohan creating scrap books of newspaper ads, holiday photos and other collectibles from a young age. This display of imagination, confirmed her belief that creative talent in children should be provided a platform for expression that encourages and excites without overwhelming. And what better joy for children than to experience their doodles, scribbles and random thoughts, given direction, for an entire reading community to appreciate. A creative professional in Advertising and Design, Aparna is an alumnus of London's British Design & Art Direction program and has studied screenwriting in California. She is also a Kathalaya certified Storyteller. I thought of starting this initiative while raising my son Rohan who would always be absorbed in putting ideas down on paper and other materials, creating diagrams, comic strips, scrap books and what-have-you. This led me to realize that children could be terrific content generators themselves and needed their own community of children to share their work with. A lot of work produced in my creative writing workshops also received a lot of appreciation when shared with friends online and created a buzz among children of similar age groups. This confirmed my belief that kids could gain from an active, supportive audience comprising of reading and writing enthusiasts. In terms of meeting a need, there is a lot of interesting children’s fiction being generated, but the authors are finally adults writing for children. My point is to create a whole new market for child authors, creating for their contemporaries – other children. And it’s important to catch them young. While there may be Young Adult/ pre teen publishers, Timbuktoo has published authors as young as 5 and a half! The name Timbuktoo represents a land that’s remote, mysterious and exotic; a land from which there is delayed return to normalcy. (“Where had you gone – to Timbuktu?” is a conversation that generations of children have had.) In that sense Timbuktoo is a metaphor for the Imagination. You can go as far as you want, with it. Timbuktoo Publishing was born to represent this unhindered, free, individual aspect of imagining and self expression. Timbuktoo has many exciting verticals all of which are independent revenue generators. Currently, my Creative Writing weekend workshops, theme based and summer workshops and the recently launched Shakespeare Study Circle for teens, top revenue generation. My first book from Timbuktoo Publishing named My Book of Me authored by 7 children was launched in December 2013 and I have two other books launching this year. There are other new products in the pipeline including merchandise, toys, games and even gaming. Expansion is going to be 360 degrees and multi sensorial/experiential. I am inspired by so many things; it’s hard to put a finger on it. I look out for likenesses in unlike things; relishing the absurd; finding humour and incongruity in the everyday – all of which can go a long way in building the imagination. I encourage thinking along these lines by developing creative workshop modules for children. I surround myself with creative, artistic people who are passionate about what they do and we’re fortunate in the way social media has encouraged the creation of support groups for like-minded people to take their strengths and goals a level up. It’s important to imbibe, absorb and continuously learn. I make it a point to be out there watching films, plays, attending gallery events, books and product launches. Staying in touch with new technology is also critical when designing for Gen Y. Actually, I have been very fortunate in tapping a very vital need. Reading is declining in many households. So, if I can offer a child the thrill of seeing their work in print, it’s that much more motivating for them to read and write. That said, it is a concern when people ask me if I will find buyers outside the author’s family and friend circle. Obviously, books authored by children are still a niche segment. That is a perception and market that needs addressing. Hopefully, my years in advertising and brand management will come in handy here to finding solutions! What is your message for SHEROES out there? My message is one of optimism and courage. There’s never been a better time to be a woman entrepreneur. We have so much going for us in terms of corporate, training and funding support. All it takes to start is a great idea, a market need and the will to succeed. Everything else will run its course. Good luck!